Think about the air we breathe on a regular basis and not just outdoors. The EPA estimates indoor levels of pollutants, on average, are 2 to 5 times higher than outdoor. That translates into 50% of all illnesses that are either caused or aggravated by polluted indoor air. What about cleaning solutions? There are areas of concern there as well. One out of every three cleaning chemicals used in US schools has been shown to cause health or environmental problems. That is why it is important that we switch to greener cleaning products. Do you know what your kid’s school uses to keep things clean? Around the house, you could be exposed to over sixty-two chemicals in the cleaning products that you use. One way to help the environment is to save trees. Trees purify the air and prevent global warming by absorbing up to 800 lbs. of CO2 every year. Trees also intercept up to 36% of the rainfall around them, minimizing floods and water pollution caused by storm water runoff. That makes recycling paper even more vital. One ton of recycled paper translates into at least 17 trees being saved. 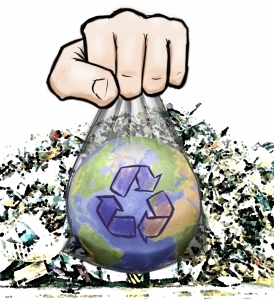 Doesn’t sound like a lot until you consider we recycle billions of tons of paper each year. What about water use? That is another area where recycling and conservation can make a big difference. The average American uses between 80 and 100 gallons of water a day while two thirds of the people in the world use less than 13 gallons per day. Even if you managed to wash one less load of laundry each month, you can save nearly 360 gallons of water per year. Are there other ways you can recycle around the house? Think about who to hire when tossing out big items like furniture, appliances and e-waste. The best recycling partner for that type of junk removal is Junk King Richmond. They’re dedicated to keeping as much of what they collect out of landfills as possible. Recycling your junk isn’t complicated when you give that job to Junk King Richmond. This entry was posted in Richmond Junk Recycling and tagged Junk King, junk removal, recycling on November 30, 2017 by Junk King. Last updated December 3, 2017 .